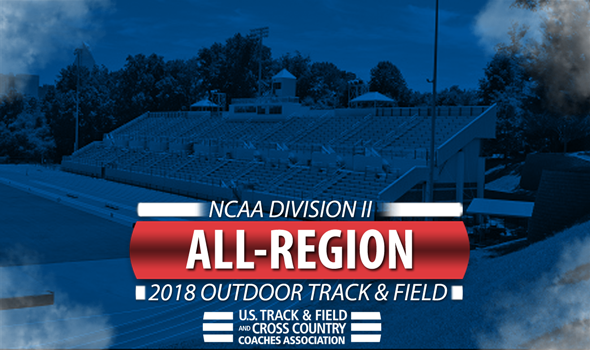 NEW ORLEANS — The U.S. Track & Field and Cross Country Coaches Association (USTFCCCA) has announced the All-Region honorees for the 2018 NCAA Division II outdoor track & field season. The top-5 individuals in each event from each region earned All-Region distinction, in addition to each of the members of the regions’ top-3 relay teams. The regions used for this award – Atlantic, Central, East, Midwest, South, South Central, Southeast and West – match those used during the indoor track & field season. On the men’s side, a total of 688 athletes earned 935 All-Region honors from 176 different institutions. A total of eight programs had 20 or more All-Region selections, with Southern Connecticut leading the way with a whopping 34. Grand Valley State posted 24, followed by Tiffin with 23. Mount Olive and Texas A&M-Commerce both had 21 while Alabama-Huntsville, Pittsburg State and Queens (N.C.) notched 20 apiece. A total of 640 women from 151 different institutions picked up 929 All-Region honors. Only three women’s programs totaled 20 or more All-Region honors: Grand Valley State (31), Stonehill (27) and San Francisco State (21). A full list of the honorees can be found below. It is sorted alphabetically by team, and then alphabetically by athlete. Additionally, a chart featuring the top-performer in each region in each event can be found below. Only athletes form USTFCCCA member institutions are eligible for the award.